The incredible leadership of Ford Motor Company and its executive chairman, Bill Ford, Jr. are hardly surprising when you look at the history of the company and its founder. Henry Ford, whose father was an Irish immigrant from Ballinascarthy, Co. Cork, revolutionized how people physically move around the country – and world. He revolutionized the workplace, particularly altering the way workers are paid and how much they earn. He also forever changed the oil and gas industries, organized labor and even the pace of road and highway construction. The Ford family connection to Ireland remains strong. Edsel Ford II and his family visited in 2004. Bill Ford, Jr., the fourth generation to have a commanding role at the company, visited in August 2011. Ford was born in 1957 (his father, William Clay Ford Sr., in a fitting match, married Martha Parke Firestone of the famous tire family). He graduated from Princeton in 1979 having majored in history, where he wrote a senior thesis for which he had particularly personal insight: “Henry Ford and Labor: A Reappraisal.” He earned an MS degree in management as an Alfred P. Sloan fellow from MIT. He joined the Ford team in 1979 as a product analyst and held a variety of domestic and international assignments in manufacturing, sales, marketing, product development and finance, before becoming vice president, Commercial Truck Vehicle Center in 1994. He served as CEO from October 2001 to September 2006. As CEO, Ford introduced a series of environmentally friendly cars, and in 2005, he hired William McDonough to redevelop the once-decaying River Rouge manufacturing facility and turn it into a sustainable operation with the largest green roof in the world. A member of the board since 1988, Ford became chairman in 1999. He also serves as chairman of the board’s Sustainability Committee. Ford established the William C. Ford, Jr. Scholarship Program, which provides scholarships for children of Ford workers in the U.S. He has donated millions from his compensation to this scholarship program since 2005. He also is very supportive and takes an active role in children’s charities in the Detroit area. This past November, he and his wife, Lisa, the mother of their four children, served as Grand Marshals of the Thanksgiving Day Parade in Detroit. 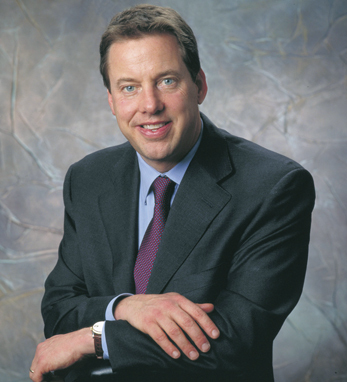 Click here to read Patricia Harty’s full interview with Bill Ford, Jr.